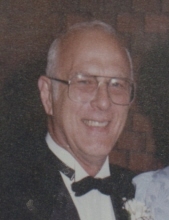 On Saturday, April 13, 2019 George C. Pierpont, beloved husband of Margaret M. who preceded him in death; loving father of George G. Pierpont, Michael F. Pierpont, Mary G. Workman, Carol A. Pierpont, Mary K. Arnold and Thomas P. Pierpont; brother of Charles V., Donald S., both preceding him in death, and a surviving brother, Phillip E. Pierpont. Also survived by six granddaughters and six great-grandchildren. George retired from Armco Steel after a long career, was co-founder of Pier-Sol, and a generous supporter of St. Jude’s Childrens Hospital designing and building specialized assistive devices. A Mass of Christian Burial will be held at St. John Catholic Church, 43 Monroe St., Westminster on Wednesday, April 17th at 10:30 am. The family will receive friends at Pritts Funeral Home and Chapel, 412 Washington Rd., Westminster on Tuesday, April 16th from 3 to 5 and 7 to 9pm. Memorial contribution can be made to St. Jude’s Childrens Research Hospital, 501 St. Jude Place, Memphis TN 38105. To send flowers or a remembrance gift to the family of George Charles Pierpont, please visit our Tribute Store. "Email Address" would like to share the life celebration of George Charles Pierpont. Click on the "link" to go to share a favorite memory or leave a condolence message for the family.